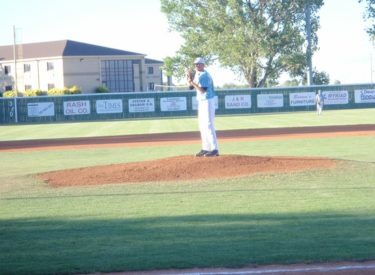 The Liberal Bee Jays scored four first inning runs and never looked back in an 8-1 win over the West Texas Outlaws Friday night at Brent Gould Field. College of Sequoias right hander John Niggli improved to 3-2 pitching five innings striking out five and allowing just three hits. Trinity’s Tyler Rockafellow pitched two scoreless innings in relief. Chandler-Gilbert’s Aaron Mees was 3-4 with a double and an RBI. Concordia’s Joe Vaskas and Texas Pan American’s Mike McCarthy collected two hits a piece. Louisiana Tech’s Will Alvis blasted his second homer of the summer. Seward’s Paul Pulley started the game for the Outlaws on the mound and also played third base. The Bee Jays have won five in a row and are 14-6 overall while the Outlaws fall to 11-2. The same two teams play Saturday night at Brent Gould Field. The Sunflower Bank is the buyout sponsor and will give away cash prizes.